Happy 2015! I hope this is your best year yet. It's been a great year for novels about the Haitian earthquake. I enjoyed Serafina's Promise and A Song for Bijou, which were both geared towards middle grade and middle school students. Thanks to NetGalley, I got to read Laura Rose Wagner's Hold Tight, Don't Let Go. Due to the language and some of the situations related to the bleak options for young girls, I would recommend this book for mature eighth graders and up. But I definitely recommend it! Magdalie often forgets that she and Nadine aren't even really sisters. Magda was taken in by Nadine and her manman, living a simple life of school and helping manman clean the house of her cruel boss. Everything changes when the earthquake happens. Manman is a casualty of the disaster, Nadine moves to Florida to be with her father, and Magda has to find where she belongs in Haiti. It is interesting to see what authors focus on when describing the aftermath of the January 12, 2010 earthquake. Wagner isn't graphic; she tackles the internal uncertainty that resulted. "We are still afraid of sleeping under cement roofs. Everybody is--everybody in this city is afraid of that. Everybody is ready to run all the time…We dream about earthquakes--in our nightmares we are frozen and cannot run. The kid Kervens who lives in the tent near the mapou tree, he was under the rubble for seven hours on January 12, and now he won't sleep without his sneakers on his feet." Wagner was in Haiti for the four years living up to the earthquake, so she has a good grasp on the before and after of the event. Her love for the country and culture shines through. The characters are well-rounded and aren't victims, even in the worst circumstances. I particularly enjoyed Safira, a friend who purchased medicine to save her mother's life by getting impregnated by a man with some money. Safira remains an optimistic influence on those around her, even though she has made difficult choices. I hope that Hold Tight, Don't Let Go is translated into Creole so that Haitians can enjoy it. There is so much pride in this novel. "Rayi chen, di l dan li blan…You hate the dog, but you have to admit that it has beautiful white teeth." This saying comes up several times in the novel and I think it really emphasizes Wagner's point. 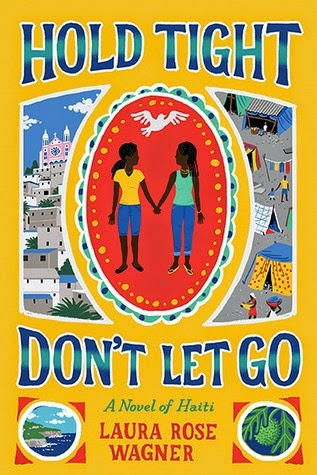 There are so many different sides to Haiti and this novel gives us a good view of them.